Cynthia Tucker is a woman who has long been devoted, in her own words, to “giving abridged or interrupted voices their due.’’ Her primary focus has been on researching, revealing and showcasing the lives and artistic accomplishments of other women, including women marginalized by race or disability. She has been a “behind the scenes” advocate and mentor for many women, devoting much of her life to showcasing women’s experiences through written and visual expression. Cynthia came to feminism naturally. She was born in New York City and raised in a nearby New Jersey suburb. Her mother, an underpaid bilingual stenographer, was a lifelong card-carrying member of NOW who gave her daughters inaugural subscriptions to Ms. Magazine. Her father always believed in the abilities of women and treated them with respect. Like many, Cynthia was motivated to action in the early 1970s by her realization of the need for change in the larger society. She became involved in local politics and served as a delegate to the Democratic National Convention in 1972, supporting the candidacy of Shirley Chisholm. In Miami, she saw that despite having their own agenda, women were not taken seriously, in some cases not even by themselves. She returned to her faculty position at Memphis State determined to ditch politics and take up feminism – and to do this at an institution where the female faculty members were still expected to make the coffee. Cynthia became passionate about bringing women’s voices and lives to the forefront. She shifted her professional focus from literary criticism to discovering works written by women authors and validating women’s experiences. Unable to convince departmental administrators of the need to change the then primarily male, white canon of literature taught at the university, she began a very popular “Women’s Writings” course through the Continuing Education Department. At the same time, Cynthia was energized by changes she perceived in the larger world and continued to use that energy to move her department and the university toward greater inclusiveness of vision. 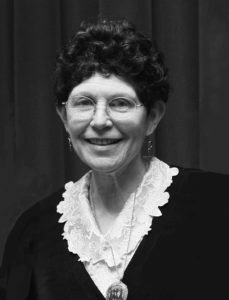 In the mid-1970s, Dr. Tucker was part of a major and successful class action suit on behalf of all female employees at the university. She worked to develop the university’s Comparative Literature program and served as its founding director. She also helped midwife the university’s Women’s Studies program, serving on the steering committee for 10 years. Cynthia began a lecture series, “Women’s Images through Time,” and continued to press for the inclusion of women, including women of color, in the literature curriculum. She taught a groundbreaking course on women’s literature in the 1970s and repeatedly submitted proposals for such courses until they were finally accepted into the standard literature curriculum in the mid-1980s. It was in a class that Cynthia taught on “Women’s Voices as Writers and Artists” that she met student Patricia Cline, a talented quilter, a woman at midlife living with a severe disability. Already a seasoned biographer, Tucker realized the importance of Cline’s written and fabric work and eventually assembled Cline’s writings and photographs of her work into a wonderful biography, Spirited Threads: A Fabric Artist’s Passion for Life – The Art and Writings of Patricia Roberts Cline which was published shortly after Cline’s death. Cynthia became interested in the autobiographical and political messages in the visual arts by women and produced several programs and exhibitions on women and art and women artists. Eventually she took up the needle herself and assembled an interracial group of women artists and quilters to complete Pat Cline’s unfinished quilts. She has authored five biographies of creative and risk-taking women and has lectured, written and taught about many more. Her most recent book is No Silent Witness which details the lives of activist Unitarian Universalist women in the late 19th and early 20th century. That title received the 2010 Frederick C. Melcher Award for Significant Contribution to Religious Liberalism. In a description of Pat Cline, Cynthia describes “her rage for truth-telling, her stubborn refusal to honor divisive boundaries and her heresy of acknowledging that the personal and the political are cut from the very same cloth.” These words might well be used to describe Cynthia herself. Cynthia Tucker has taken up the torch of ensuring that the courageous lives of women who have gone before us and who live among us, shall not be overlooked or forgotten. This Woman of Achievement’s vision continues to expand our own.